Reliance Jio Has The Fastest 4G Speed; Airtel & Vodafone Fail To Impress! TRAI has released a new speed report which reveals that Reliance Jio has the highest 4G download speeds in the entire country. Cheaper data prices have resulted in a massive increase in sale of mobile data based packs compared to voice-only plans. The speeds achieved by Jio is more than the double compared to Airtel and other incumbents. According to the TRAI report, Reliance Jio is the fastest among all the 4G telecom operators in India with an average download speed of 22.3 Mbps. Reliance Jio has achieved 22.3 Mbps on its network, the highest for any operator in the segment. Airtel is on the second spot with an average download speed of 9.7Mbps. 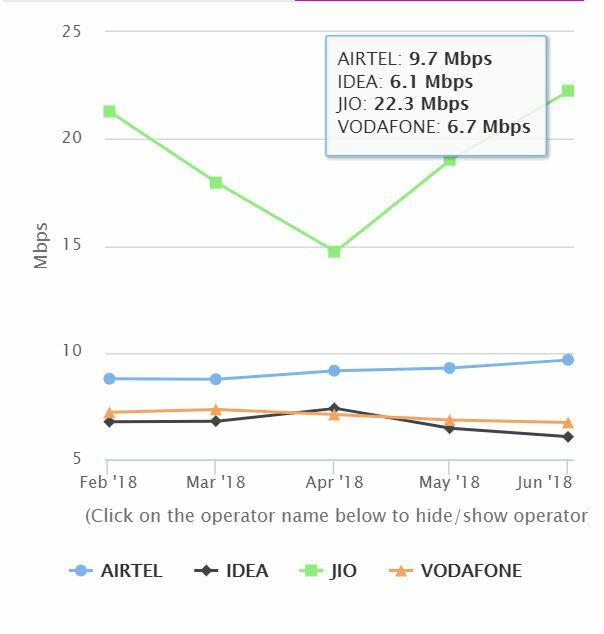 Vodafone India and Idea Cellular are up next with download speeds at 6.7 mbps and 6.1 mbps respectively. With a huge surge in terms of media consumption over mobile, the speed plays a major role. The data costs are going down with operators offering more data at lesser price. But maintaining a healthy download speed is important for an overall experience. Reliance Jio has been able to maintain a higher download speed compared to other incumbents. Whenever you are streaming a video online or watching Live TV, higher data download speed enhances the viewing experience. Also, better speeds contributes to faster browsing, emails and live music playback. Reliance Jio has topped the list in terms of download speeds, but the Aditya Birla led Idea Cellular has registered the highest upload speeds in May. Idea has topped the 4G upload speed list nationwide with an average 4G upload speed of 5.9 mbps in May. Idea is followed by its partner Vodafone, which has registered a peak upload speed of 5.3 mbps in the entire country. On third and fourth are Jio and Airtel, with 5.1 mbps and 3.8 mbps upload speeds respectively. A higher upload speed is required when you are uploading or sharing any data online. This includes sharing data like images, videos and any kind of file through email, any social media site or applications. How TRAI Calculated Download & Upload Speeds? All the download speed and upload speeds were calculated in terms of real-time usage. The test was conducted by the controlling telecom statutory body, Telecom Regulatory Authority of India (TRAI) using My Speed Portal. My Speed Portal tests both the upload and download speeds on a real-time basis to detect the average speeds. Reliance Jio has topped the list with the highest nation-wide download speeds, and Idea Cellular is ahead in terms of upload speeds. The upload speed has seen a deterioration since the month of March, while download speeds has seen a slight rise. "Reliance Jio Has The Fastest 4G Speed; Airtel & Vodafone Fail To Impress! ", 5 out of 5 based on 2 ratings.